People have been using plasticisers (US: plasticizers) to make things soft and flexible for thousands of years. Water has been used to soften clay since the early evolution of man and oils are known to have been used centuries ago to plasticise pitch for waterproofing boats. Tip: Scroll to the bottom to find more information on individual plasticisers. Modern plasticisers (US: plasticizers) are similar and different at the same time – constituting a wide range of chemistries and molecules bringing high performance in a wide array of applications in a safe and sustainable manner. They are colourless and odourless liquids which cannot be simply treated as additives like pigments or fillers. 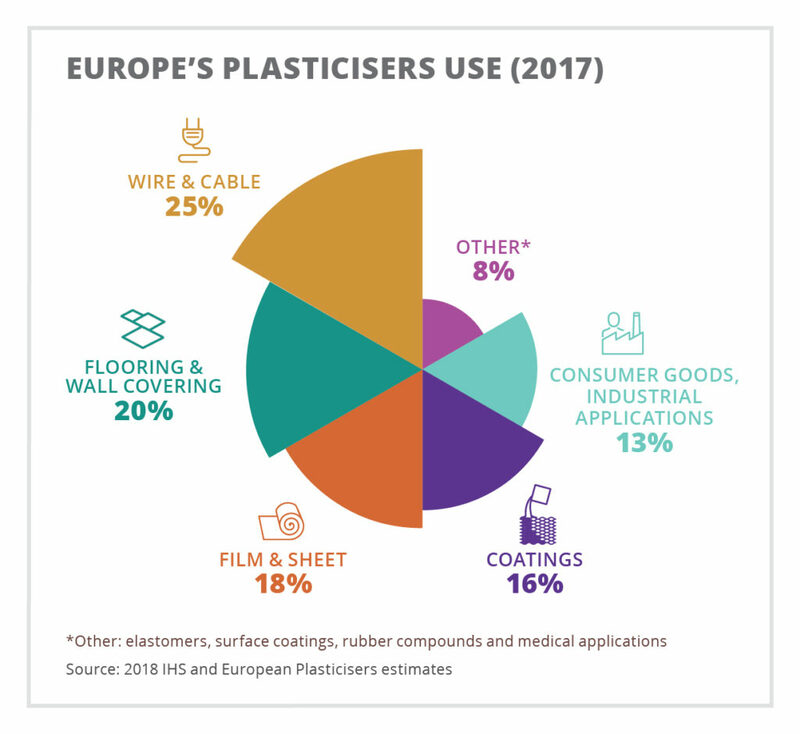 Today, over 85 percent of all plasticisers consumed in Europe are employed in flexible PVC applications, largely for the construction, automotive and wire & cable sectors. They are, in fact, major functional substances that transform the physical properties of PVC and other polymers creating a whole new world of flexible and durable finished articles for high performing applications. Over the last 60 years more than 30,000 different substances have been evaluated for their plasticising properties. Of these, only a small number – approximately 50 – are today in commercial use after meeting the rigorous performance, cost, availability, health and environmental requirements which are imposed by the market, users and regulators. 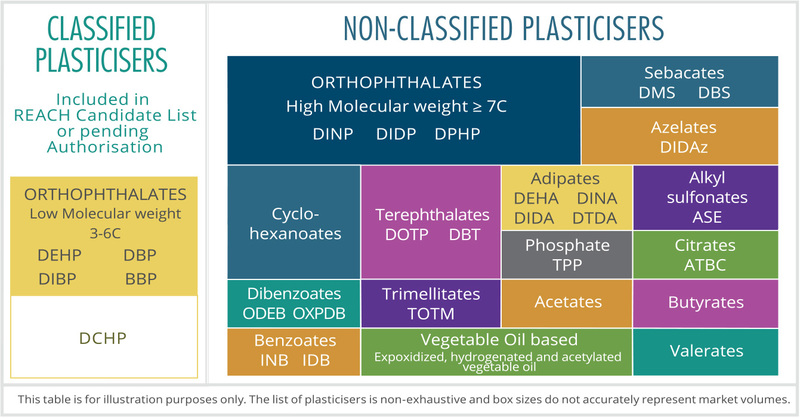 The most common plasticisers include esters such as adipates, azelates, citrates, benzoates, orthophthalates, terephthalates, sebacates, and trimellitates. They are produced by reacting an alcohol (such as isononanol or 2-propylheptanol) with an acid such as phthalic anhydride, terephthalic acid, adipic acid, trimellitic anhydride to name a few of the common starting materials. Different alcohols and different acids will lead to plasticisers exhibiting different degrees of permanence, performance and compatibility with PVC. Today, over 85 percent of all plasticisers consumed in Europe are used in flexible PVC applications. They give PVC the flexibility and elasticity needed for many different applications, particularly in construction (sheathing for electric cables, roofing membranes, flooring and wall coverings), in the automobile industry (trim, cables, under body sealants), furniture and artificial leather goods. Plasticisers are major functional substances that transform the physical properties of PVC and other polymers creating a whole new world of flexible and durable applications. Because plasticisers (US: plasticizers) are so widely used, they have undergone extensive testing for possible health and environmental effects and are amongst the most widely researched of all chemical substances. In Europe, the safe use of plasticisers is enabled by REACH, the most comprehensive product safety regulation anywhere in the world. Globally, 7.5 million tonnes of plasticisers (US: plasticizers) are consumed every year, of which European consumption accounts for over 1.35 million tonnes. Orthophthalates, due to their high degree of compatibility with PVC, are the most widely consumed plasticisers. 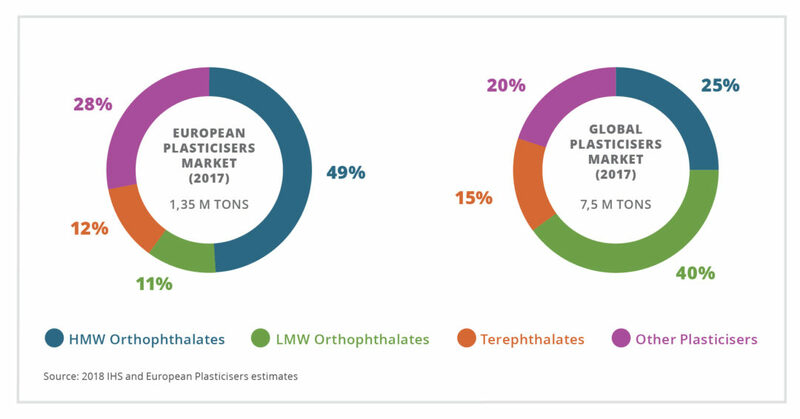 As can be seen from these figures, major plasticisers are high volume commodity chemicals, which take decades and billions of Euros to achieve full commercial development. 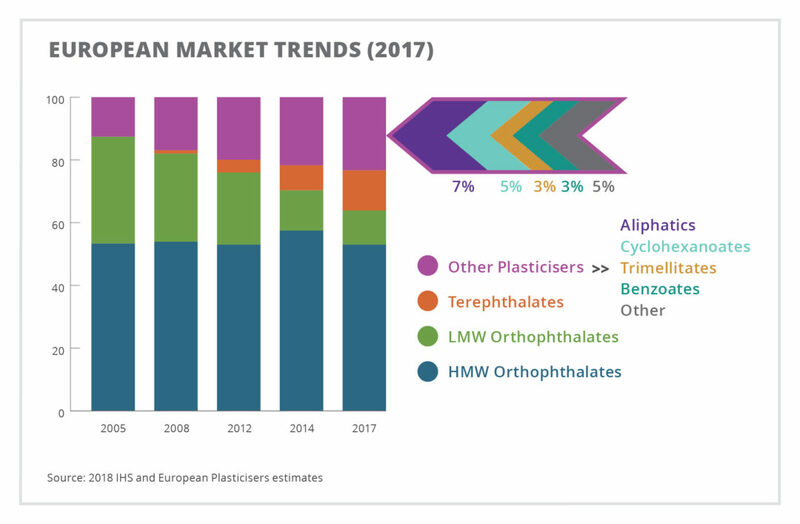 In Europe, orthophthalates – also know simply as phthalates (LMW and HMW) – make up for the majority of the plasticisers market followed by aliphatics and cyclohexanoates. However, DEHP (LMW) still makes for almost 40 percent of the global consumption because it is still widely produced and used in China, India, and other parts of Asia, the Middle East, Africa and Latin America. The graphs below show this distribution in the European market as a whole and specifically in Western Europe. Trimellitate Tris-2-ethylhexyl trimellitate TOTM 3319-31-1 222-020-0 Yes Cables and wires, Film and sheet, Medical Applications Not class. Terephthalate Dioctyl terephthalate DOTP/DEHT/DEHTP 6422-86-2 229-176-9 Yes Flooring, Food packaging - Cling Wrap, Toys, Medical Applications Not class. Terephthalate Diisobutyl terephthalate DBT 1962-75-0 217-803-9 No Adhesives & Sealants Not class. Sulfonamide N-butyl benzene sulfonamide BBSA 3622-84-2 222-823-6 Yes Used in nylon (or polyamide) 11 and 12 for automotive applications and tubes, hoses, pipes Not class. Succinate Diethylsuccinate DES 123-25-1 204-612-0 Yes Cosmetics (eg as solvent for nail polish) Not class. Succinate Dimethylsuccinate DMS 106-65-0 203-419-9 Yes Coatings Not class. Sebacates Di-isodecyl sebacate DIDS 28473-19-0 249-047-0 Yes Not class. Sebacates Di-2-ethylhexyl sebacate DOS 122-62-3 204-558-8 Yes Not class. Sebacates Dibutyl sebacate DBS 109-43-3 203-672-5 Yes Pharmaceutical and food contact approved, used in coatings (for pills, etc) Not class. Sebacates Dimethyl sebacate DMS 106-79-6 203-431-4 No Adhesives & Sealants Not class. Polymeric Hexanedioic acid, polymer with 2,2-dimethyl-1,3-propanediol and 1,2-propanediol, isononyl ester 208945-13-5 Yes Film and sheet, Food packaging - Cling Wrap Not class. Polymeric Hexanedioic acid, polymer with 1,2-propanediol, octyl ester 82904-80-1 Yes Film and sheet, Food packaging - Cling Wrap Not class. Polymeric Hexanedioic acid, polymer with 1,2-propanediol, acetate 55799-38-7 Yes Film and sheet, Food packaging - Cling Wrap Not class. Phosphate ester Tris(2-ethylhexyl) phosphate 78-42-2 201-116-6 Yes Not class. Phosphate ester 2-ethylhexyl diphenyl phosphate 1241-94-7 214-987-2 Yes Not class. Phosphate ester Triphenyl phosphate TPP 115-86-6 204-112-2 Yes Flooring, Wall coverings Not class. Other ester 2,2,4-trimethyl-1,3 pentanediol di-isobutyrate TXIB 6846-50-0 229-934-9 No Flooring, Adhesives & Sealants, Toys Not class. Other ester Pentaerythritol ester of valeric acid PETV 15834-04-5 239-937-7 Yes Flooring, Automotive , Toys Not class. Other ester Alkylsulphonic acid ester with phenol ASE 91082-17-6 293-728-5 Yes Adhesives & Sealants, Food packaging - Cling Wrap, Toys Not class. Other ester 2,2'-ethylenedioxydiethyl-bis-(2-ethylhexanoate) 94-28-0 202-319-2 No Film and sheet Not class. Orthophthalate Di-C16-18 alkyl phthalate 90193-76-3 290-580-3 No Cables and wires Not class. Orthophthalate Benzyl C7-9-branched and linear alkyl phthalate 68515-40-2 271-082-5 No Flooring, Adhesives & Sealants Not class. Orthophthalate Diisotridecyl phthalate DTDP 68515-47-9 271-089-3 Yes Cables and wires, Automotive Not class. Orthophthalate Diisoundecyl phthalate DIUP 85507-79-5 287-401-6 Yes Cladding and Roofing, Cables and wires, Automotive Not class. Orthophthalate Di(2-propyl heptyl) phthalate DPHP 53306-54-0 258-469-4 Yes Flooring, Wall coverings, Cladding and Roofing, Cables and wires, Film and sheet, Automotive , Tubes & Hoses, Coated Fabrics Not class. Orthophthalate Diisodecyl phthalate DIDP 68515-49-1 271-091-4 Yes Flooring, Cladding and Roofing, Cables and wires, Film and sheet, Automotive , Tubes & Hoses, Coated Fabrics, Inks and waxes Not class. Orthophthalate Diisononyl phthalate DINP 28553-12-0 249-079-5 Yes Flooring, Wall coverings, Cladding and Roofing, Cables and wires, Film and sheet, Automotive , Tubes & Hoses, Coated Fabrics, Inks and waxes Not class. Orthophthalate Diisooctyl phthalate DIOP 27554-26-3 248-523-5 No Not class. Orthophthalate Di-n-octyl phthalate DNOP 117-84-0 204-214-7 No Not class. Orthophthalate Di-n-propyl phthalate 131-16-8 205-015-8 No Not class. Orthophthalate Diethyl phthalate DEP 84-66-2 201-550-6 Yes Adhesives Not class. Orthophthalate Dimethyl phthalate DMP 131-11-3 205-011-6 Yes Adhesives Not class. Epoxy ester Epoxidised soybean oil ESBO 8013-07-8 232-391-0 Yes Automotive , Food packaging - Cling Wrap Not class. Epoxy ester Epoxidised linseed oil ELO 8016-11-3 232-401-3 No Not class. Cyclohexanoate Di-isononyl cyclohexane dicarboxylate DINCH 166412-78-8 431-890-2 Yes Flooring, Wall coverings, Film and sheet, Automotive , Adhesives & Sealants, Tubes & Hoses, Coated Fabrics, Food packaging - Cling Wrap, Toys, Medical Applications Not class. Citrate Acetyl tributyl citrate ATBC 77-90-7 201-067-0 Yes Food packaging - Cling Wrap, Toys, Medical Applications Not class. Citrate Tributyl citrate TBC 77-94-1 201-071-2 Yes Biobased plasticizer used in paints, coatings and inks Not class. Citrate Triethyl citrate TEC 77-93-0 201-070-7 Yes Not class. Benzoate Tri-ethylene glycol dibenzoate 51747-38-7 Yes Not class. Benzoate Isodecyl benzoate IDB 131298-44-7 421-090-1 Yes Flooring, Wall coverings, Automotive , Adhesives & Sealants, Inks and waxes Not class. Benzoate Isononyl benzoate INB 670241-72-2 447-010-5 Yes Flooring, film and sheet Not class. Benzoate Dipropylene glycol dibenzoate 27138-31-4 248-258-5 Yes Flooring Not class. Benzoate Diethylene glycol dibenzoate 120-55-8 204-407-6 Yes Flooring Not class. Benzoate Neopentylglycol dibenzoate 4196-89-8 224-081-9 Yes Not class. Azelate Diisodecyl azelate DIDA 28472-97-1 249-044-4 No Automotive , Adhesives & Sealants Not class. Adipate Bis[2-(2-butoxyethoxy)ethyl]adipate DBEEA 141-17-3 205-465-5 Yes Not class. Adipate Di-(2-butoxyethyl)adipate DBEA 141-18-4 205-466-0 Yes Not class. Adipate Di-n-butyl adipate DBA 105-99-7 203-350-4 Yes Not class. Adipate Ditridecyl adipate DTDA 16958-92-2 241-029-0 No Not class. Adipate Diisodecyl adipate DIDA 27178-16-1 248-299-9 Yes Not class. Adipate Diisononyl adipate DINA 33703-08-1 291-426-8 Yes Adhesives & Sealants, Food packaging - Cling Wrap Not class. Adipate Di-2-ethylhexyl adipate DEHA 103-23-1 203-090-1 Yes Flooring, Wall coverings, Cladding and Roofing, Film and sheet, Automotive , Tubes & Hoses, Coated Fabrics, Inks and waxes, Food packaging - Cling Wrap, Toys Not class. Adipate Benzyl 2-ethylhexyl adipate BOA 905-983-8 Yes Not class. Adipate Diisobutyl adipate DIBA 141-04-8 205-450-3 Yes Not class. Acetate Glyceryl triacetate 102-76-1 203-051-9 Yes Not class.